The M1 Abram is the current main battle tank for the United States Army. Originally developed in 1976 as the XM1, and still made today by "General Dynamics Land Systems", the Abram was named after Creighton Abrams, and was set out to replace the older M60 tanks that were beginning to show signs of aging. Even though its main purpose is to serve the U.S. Army, several Abrams have been exported to countries such as Saudi Arabia, Egypt, and Kuwait to assist their countries armed forces against possible attack. As for armaments, the M1 Abram's main cannon is the 105mm M68A1, a rifled cannon found on the standard M1 model. The tank carries up to 55 rounds for its main cannon. Along with that, the ever so popular M2 "Ma Duce" .50 Caliber machine gun found just about everywhere on everything is left to the Abram commander, with a total of 1,000 rounds of ammunition. The Abram also features twin M240 7.62mm machine guns; one under the control of the loader, and another being its coaxial weapon, located near the main cannon. The average amount carried for these twins are 11,400 rounds of 7.62mm ammunition. Along with firepower, the M1 has two M250 smoke grenade launches that can be discharged out to cover its movements, along with the ability to block out any thermal readings that any unfriendly armor tries to pick up. The Abram features a powerful gas turbine AGT 1500 Honeywell engine. Its transmission, the X-1100-3B, allows the Abram to have up to four gears forward, and up to two in reverse. Her armor is made up of ceramic blocks, and other standard armor types. This combination is both lightweight and still strong enough to take the hits. 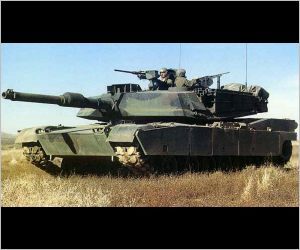 In 1985, a new version of the tank known as the M1A1 hit the production lines. This was the first step at a major upgrade for the Abram, and gave it improvements in both its offence and defense. The German made M256, a 120mm smoothbore cannon, now replaced the tanks main cannon, the M68A1. When equipped with this new cannon, the amount of rounds carried for it goes down to about 40. Mix the new cannon with the A1's improved suspension and fire control, and the new version has greater chance at hitting targets wile on the move. Later, the armor on the M1A1 started using depleted uranium instead of the old standard, and wile the extra armor knocked its speed down and increased the weight of the already heavy tank, the extra protection was well worth it. Another step up of the new M1A1 is its new NBC (Nuclear, Biological, Chemical) system, which keeps all the nasty stuff out and keeps the air clean for the guys inside. It can also warm or cool the air incase the troops are stuck wearing there bio suits for the day. A nice treat indeed. Finally, the new Abrams blow out panels has been decreased from the older model. The standard M1 had 3; wile the newer M1A1 now only has 2. Later in 1986, the M1A2 model came about. The upgrades in the model were nothing major like the cannon switch on the M1A1, but instead mostly electronically. Upgrades include things like new processors, more memory for the electronics, For example, most of the electrical controls are no longer in the same area, so one good smack won't ruin everything. New upgrades with the System Enhancement Package include things like more memory, better processors, new flat panels, new power units, and a lot of 2nd generation gear like better infrared sights and thermal systems. All this leads up to great improvements in acquisition (over 70%!) and engaging targets. The M1 Abram has proven its self in many conflicts now, and remains as a strong right arm in the military's arsenal. Be sure to check out the M1 Abram in mission 8: Zebra Straw, and mission 10: Fever Claw. Height : 9' - 6"